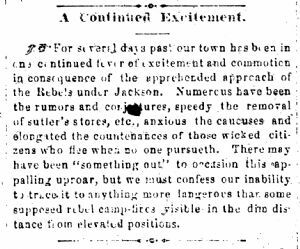 For several days past our town has been in one continued fever of excitement and commotion in consequence of the apprehended approach of the rebels under Jackson. Numerous have been the rumors and conjectures, speedy the removal of sutler’s stores etc., anxious the caucuses and elongated the countenances of those wicked citizens who flee where no one pursueth. There may have been “something out” to occasion this appalling uproar, but we must confess our inability to trace it to anything more dangerous than some supposed rebel camp-fires visible in the dim distance from elevated positions.